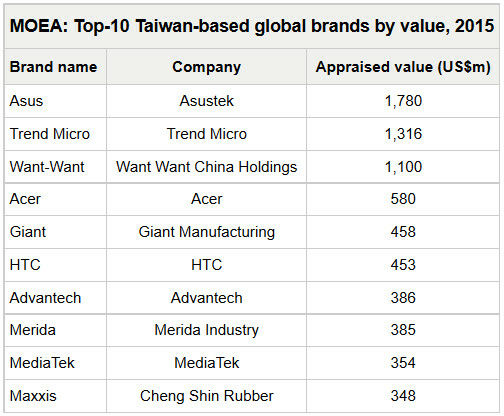 According to a list released by the Ministry of Economic Affairs in Taiwan, Asus is the leading brand in the country, valued at $1.78 billion USD. The company has hit a home run with the globally offered Asus ZenFone 2, the first smartphone to be offered with 4GB of RAM. The next mobile company on the list is Acer, valued at $580 million. Sixth on the list with a value of $453 million is HTC. The beleaguered manufacturer has just released the HTC One A9, which might not have what it takes to help HTC turn things around. Chipmaker MediaTek takes the ninth spot on the list, valued at $354 million. While the MOEA provides the list, the valuations are calculated by Interbrand, a U.K. branding expert. According to the Taiwan economic agency, the top 20 brands in Taiwan are worth US$8.956 billion in 2015. That happens to be up 2.6% from the value of the top 20 Taiwan firms that was calculated last year. Tells a lot about how deep a pit htc has fallen into and they brought it upon themselves. If Asus can find success in mobile business, then htc has no excuses. I love when ppl talk whitout knowing what they are talking about. Asus make MUCH MUCH more money with computers part than mobile you idiot. HTC dont make computers part. Sure Asus got a lil increase in value this year thanks to mobile but its only a small part of the total value thats Asus worth now. So ofcourse if HTC has issue its will loose value faster. Well, it's very unlikely, why? Because: Asus have a wide array of producs like laptops, motherboards, smartphones, etc. and they are not lack in sales and popularity. Unlike Mediatek that only focuses on semiconductor business. Semiconductor alone won't beat Asus. HTC should learn a lot from Asus, especially on pricing. HTC = mobile only. Asus = computer part , laptop , tablet and mobile. Cant compare the two. The moment when even the Taiwanese also stop giving a d@mn about HTC, is the time they should realized how far they had disgrace them self. Taiwan and S. Korea have similarity in top brands rivalry. Asus and Acer's rivalry is similar to Samsung and LG's. HTC? Well, l think it would end up like Pantech. Why so much hatred to Taiwan? Where is TMSC? Not that it matters. Asus still has a long way to go in smartphones.Hope they try to compete at flagship level too.Asus should use latest processors and start competing at top level.